A little over a week has passed since the 2012 presidential election, and news coverage abounds with discussion on women’s involvement in politics in “The Year of the Woman,” so I thought it fitting that my first post should highlight Peck’s participation in the political arena. Headlines this past week read, “How Women Ruled the 2012 Election and Where the GOP Went Wrong” and “Women in Politics Break Records in 2012.” Interestingly, these banners mirror news article titles from the 1912 Presidential Election: “Women Leap Suddenly into Political Favor” (New York Herald, Aug. 11, 1912) and “Women in the Thick of PoliticalFight ” (New York Tribune, Aug. 14, 1912). By 1914, Peck was the president of the Joan of Arc Suffrage League in New York; she had begun to join with various other leagues to fight for women’s vote in the state of New York, and her image was that of a woman mountain climber and a political activist. It’s remarkable that Peck’s quote, above, sounds as if it could have been used in the same campaign rhetoric leading up to our recent election, which included such phrases as “the War on Women,” “women’s right to decision-making over their own bodies,” and “equal pay for equal work.” Sadly, many of the arguments for women’s rights from the turn of the last century remain the same today. Would Peck be happy with women’s new, “high” numbers of representation in Congress? Probably not. While women had won the right to vote by 1920, they had not earned the political power that should come with it. Women’s organizations that fought for suffrage dissipated once the consolidating issue of suffrage disappeared. While Peck still demanded equal treatment until she died, in the end, the numbers of successes that she was able to maintain were small because there were no cohesive women’s organizations left to push a progressive agenda. And, our political power is still lacking. In 2012, women hold 90 (or a measly 16.8%) of the 535 seats in the 112th U.S. Congress. The 113th Congress will include a record number of women: 20 senators and at least 81 representatives. Maybe we can take a lesson from the women and men who fought for our right to vote in the past – women’s civil rights can only be achieved if we carry on working together, with the help of organizations who continue to push a progressive women’s agenda such as Emily’s List and Planned Parenthood Action Fund. This entry was posted in Uncategorized and tagged 2012 election, Annie Smith Peck, Hannah Scialdone-Kimberley, Theodore Roosevelt, women's suffrage, women's vote, Woodrow Wilson, year of the woman on November 13, 2012 by Hannah Kimberley. Well said! Annie would love this blog! Hi Emma – great question. Yes, Annie certainly questioned women’s sphere, which she defined as being outside of the “sphere of action.” So, women’s sphere was inside the home, and the sphere of action housed universities, professions, and business. One of Peck’s first published works, an 1876 article titled “Women in the Homeric Age,” argues that women have not advanced in education, social life, and family relations, nor in terms of professionalization since the time of ancient Greece. By the end of her essay, Peck makes the point that while modern nineteenth – century women had not achieved equality, they nonetheless had expanded their “sphere of action,” and she is proof of this because she is writing from the university (21). She concludes with the position that women have reached a point of no return – one in which women have more aspirations and drive than they ever had before, and this is the kind of reasoning that Peck would follow in her writing for the rest of her life. 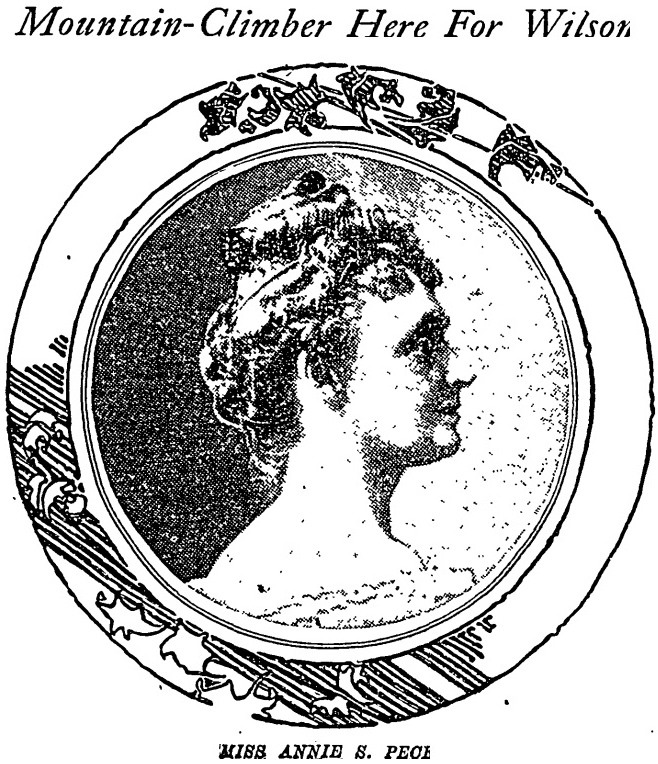 Peck maintained that women differed in terms of partisanship, and in terms of reforms such as capital punishment, of which she was a proponent (“Annie S. Peck’s Views”). Peck took an anti-essentialist stance by insisting that it shouldn’t make a difference if someone is a man or a woman – each should have the same rights no matter what. She was also adamant that no one should define women’s sphere. This was part of her problem in terms of public relations – she did not fit the sweep of the time. Peck can be categorized as a conservative radical. She had a radical view of human nature; she believed that the differences between men and women were overblown. Likewise, she did not want special treatment for women. Peck was critical of other women who she viewed as misrepresenting women, which meant that they worked to discredit Peck as well. For instance, while Peck noted that Jane Addams was “an admirable woman in many ways,” she also argued that she was “mistaken” in her support for Roosevelt’s campaign (“Wilson Women Wind Up). That both Roosevelt and Addams argued for suffrage was not enough for Peck; rather, Peck was sure that women would get the vote in her lifetime and she did not want her voting rights based on her ‘natural’ inclinations as a woman since she “object[ed] to having our sphere decreed by others.” Addams, along with many suffragists, defines a generation of progressive women; however, they go about gaining progressive measures via a conservative social basis (i.e., women are naturally nurturing), and Peck rejected outright this kind of reasoning. Who knew That 100 years later women would make such a difference due to their voting power. Although not exactly “leaping into political power” in the House and Senate, there has certainly been some slow and steady progress. Thanks for making Annie relevant in 2012. Thanks for your response, Joan! Yes, we did indeed make a difference this year! Love it! Annie would be proud! Thanks, Kevin. I am glad to know that you will get to know her even better now.